An influential financier who opposed Donald Trump’s campaign before swinging the support of one of the largest dark money organizations in the nation to the president has been named to take over the finances of the Republican National Committee. Todd Ricketts, the son of billionaire TD Ameritrade founder Joe Ricketts, is affiliated with both 45Committee and Future45. The 45Committee, a dark money organization, and Future45, a super PAC, collectively spentalmost $46 million during the 2016 election cycle to support Trump after he became the Republican Party’s presumptive nominee. The expenditures were made late in the election cycle, and included $13 millionspent in one day. The 45Committee has remained active in the wake of the election. The organization claims to have spentmore than $4 million supporting Trump’s Cabinet nominees. 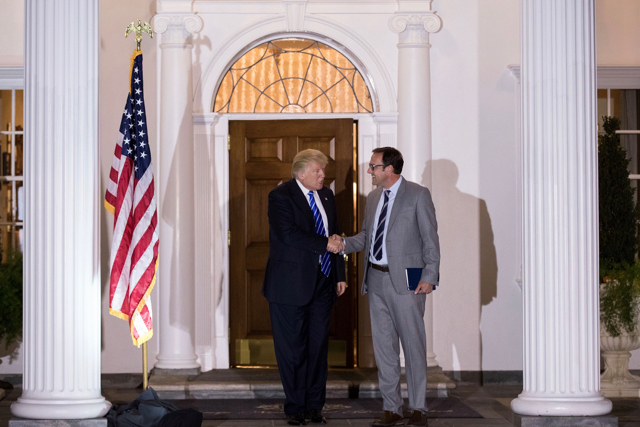 Ironically, Todd Ricketts was one of the president’s top appointees, but he was forced to withdraw his nomination to be the No. 2 official in the Commerce Department in April because he was unable to comply with ethics rules requiring him to divest significant parts of his financial holdings. The organization was also deeply involved in the effort to confirm Supreme Court Justice Neil Gorsuch. Rob Collins, who is listed as one of 45Committee’s directors, claimed in his professional biography that he helped ‘quarterback’ Gorsuch’s nomination by working with at least a half-dozen White House offices, the Department of Justice, the U.S. Senate and more than 20 advocacy organizations. Five major outside organizations ultimately spent more than $14 million to support Gorsuch. More recently, it launched amultimillion dollar effort to support the Republican tax bill. Future45 was heavily funded by billionaire casino magnate Sheldon Adelson. Adelson and his wife donated$20 million of the $25 million Future45 received in 2016. Ricketts’ father donated another $1 million to the super PAC, and his dark money organization, ESA Fund, gave it an additional $175,000. Small Business Administrator Linda McMahon, a co-founder of the World Wrestling Federation, also gave $1 million to Future45. Unlike Future45, 45Committee is not required to reveal its donors. Tax records, however, show that 45Committee received $750,000 in 2015 from the Wellspring Committee, the dark money organization that financed Gorsuch’s confirmation campaign, tax documents show.